Want to clash with 90 million global players? Dive into LORDS MOBILE, the real-time-strategy mobile MMO game nominated as Google Play's "Most Competitive Game of 2016!" Lords Mobile is a free to play real-time strategy MMO game where you can build your own kingdom and wage wars against other players or create alliances. Winner of Google Play’s “Most Competitive Game of 2016!”, Lords Mobile has to offer something better than the hundreds of other games out there for such an award. Developed and published by IGG.COM (“I Got Games”), let’s take a look at why this game deserves such high recognition. As you launch the game you will first have to wait a bit for the game to download additional resources. After that a quick cutscene appears, explaining what happened to a once great Emperor. You’re then plunged into the tutorial section of the game. Here you will be able to see the game’s great, cartoonish 3D graphics as well as the nice animations. Character models are pretty good too. The game will first show you how to build a Barracks, which is where you will build your troops, one of the important aspects of the game. To construct a building is rather simple, as you tap on the specified areas and choose the building you’d like to build. Each building has its own set of required materials. Each building takes up real-life minutes or hours to build, but the process can speed up using Gems. The Castle is vital to the success of your kingdom. Upgrading it gives you a host of benefits, such as increased armor capacity. VIP Points are earned when your VIP level increases, but can also be earned by logging into the game daily. Before you attack an enemy, you can first scout them out in order to get more information about them and some tips on how to defeat them. Once you’ve seen all there is, you can begin the attack. To attack an enemy turf, you need Heroes and a good quantity of troops. At the start of the game you only have 1 Hero, but later on, you can unlock more as well as more slots in order to bring more Heroes to the battle. The more Heroes you deploy, the bigger the Army you can send. Heroes can be promoted to gain Battle Skills and boost your Army’s power. When you are in a battle, you can’t really control anything that’s going on. You just watch as your army pushes through enemy forces, doing their best to dominate. Both armies have Morale, which when it drops to 0% will cause the army to retreat. The number of troops can also be seen here for both armies. Battles in Lords Mobile don’t really offer anything new to the table. There’s no interaction with them either. You can’t make formations or decide from where to attack because battles are always linear, forcing you to fight against the enemy army straight away with no room to flank them. No control over troops at all, you just have to hope that your army is more powerful than the other one. After you claimed victory (or suffered defeat), you can take a look at the number of casualties both armies faced. 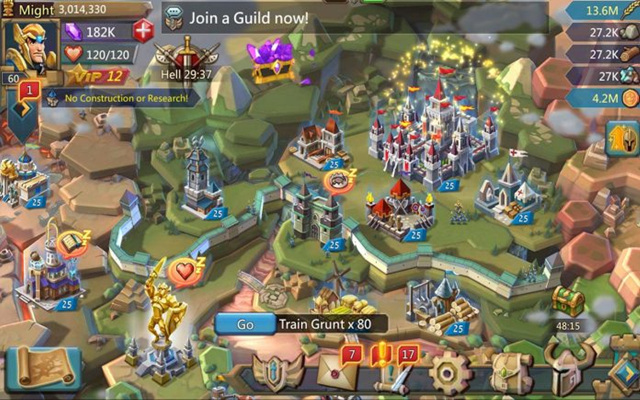 There are Guilds that you can join which will earn you 400 Gems, reduce the time it takes to train troops or make buildings, unlock Guild Quests where you can win more rewards and a Guild Shop where you can buy unique items. You can also create your own Guild with your friends if you’d like. VIP Quests or Treasure Quests aren’t actually Quests, they’re just chests that are unlocked when you reach a specific VIP level. These chests contain various materials, Gold and a bit of Gem. Admin Quests are Quests that you start and wait a specified amount of real-time minutes to finish. You don’t have to do anything, just press “Start” on one of the Quests and it begins. Once it’s finished you earn rewards such as EXP and more resources. You can go do other Quests while you wait for that to finish. Turf Quests are the main Quests in the game that you will focus on. The game will recommend you which quest you should do first, but you can do any Quest that you want. There are also Novice Relocators, which you can use to move your turf to any location you want. To do this simply head to the Kingdom Map located on the bottom left corner of the screen, then open the World Map which is that globe icon and then select the Kingdom you want and an empty tile to move to. In the Kingdom Map, you can also see other players which you can either attack or try and make friends with. Hero Stages are levels in which you can easily unlock new Heroes. Hero Stages are divided into Chapters and the goal is to clear the area of any enemy activity. You also have to deploy all your current available Heroes here in order to do battles. 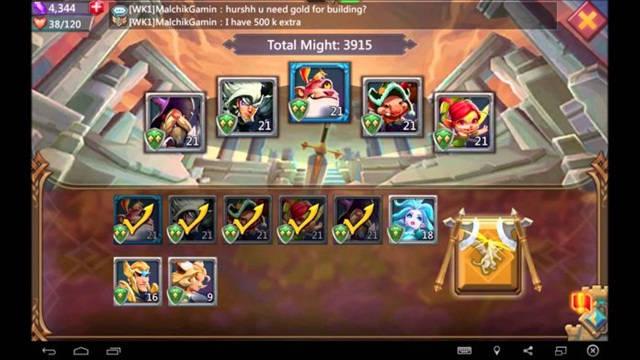 Each Hero has MP. MP is earned by fighting enemies. When you have enough MP you can unleash powerful skills. To activate a Hero’s Skill, simply tap on the Hero’s icon and it will activate. You can also target which enemy you’d like to attack with the Skill by swiping your finger at the enemy. What makes Hero Stages different from your regular fights is that only your Heroes fight here, the Skill feature can only be used here and there is a Boss fight at the end of each battle. Trophies are items such as rings that you can equip your Heroes with for increased stats such as Strength or Dexterity. There are 6 Trophy slots for each Hero. Once you fill them all up, you can promote your Hero to the next Rank. Trophies are earned by clearing Hero Stages. There are various In-App Purchases that can help you get off the ground faster and lower the time it takes to construct buildings and train troops but you can still play the game without spending any money, although later in the game you may have to spend a bit due to powerful online players. Good character models and animations. Bad gameplay, no way to control troops in battles. Level designs are linear, giving you no option to flank the enemy army. Gets boring quickly due to how repetitive and limited the battles are. Next Next post: Lords Mobile Merchandise is Now Available on the IGG Store!